Terry Stotts will begin his seventh season at the Trail Blazers' helm next Thursday when Portland plays host to LeBron James and the Los Angeles Lakers in a TNT game at Moda Center. Stotts, who turns 61 on Nov. 25, is fourth in the NBA in seniority among head coaches with the same club. Only San Antonio's Gregg Popovich (23rd), Dallas' Rick Carlisle (11th) and Miami's Erik Spoelstra (11th) are longer-tenured with the same team. Since taking over the Blazers for Nate McMillan in 2012, Stotts has compiled a regular-season record of 272-220, with winning marks in four of his six seasons. Sometime this season, Stotts will pass Rick Adelman (292-154) to move into No. 2 on the Blazer coaches win list, behind only Jack Ramsay (453-367). 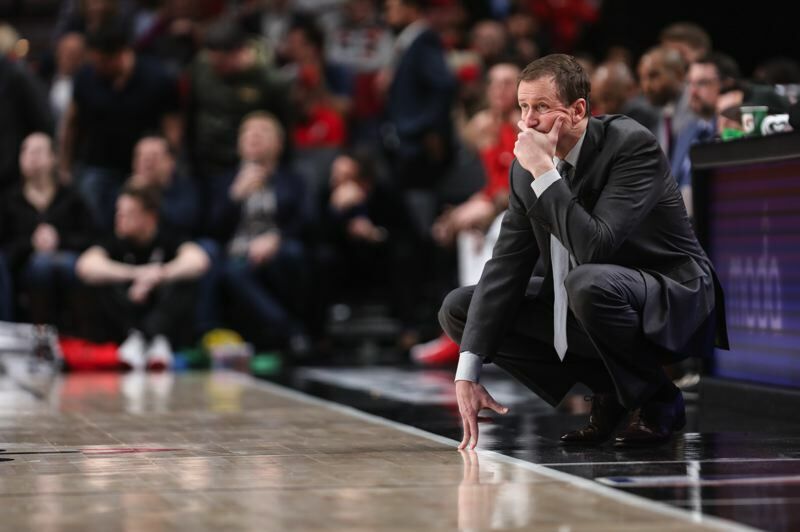 Stotts' record through 11 seasons as an NBA head coach is 387-388, including two each in Milwaukee and Atlanta. If the Blazers beat the Lakers on opening night, he'll be at .500 for his career. The former Oklahoma Sooners forward sat down with the Portland Tribune to discuss his life as a head coach in the NBA. Tribune: How do you feel about ranking so high on the NBA's coaching seniority list? Stotts: I'm proud of it. To have longevity with one team in this league is something you don't take for granted. We've overachieved a few years. We've had some relative success. None of us are satisfied, but I'm proud of what we've accomplished. Tribune: You're about to become the 47th head coach in NBA history to join the 400-win club. Stotts: Whenever you hit a milestone as a coach, it means you've been fortunate enough to be in some good situations, you've had multiple opportunities (with different franchises), and you've worked with good people along the way. That's been the case with me. Tribune: Nine coaches in league history have more than 1,000 wins — Don Nelson, Lenny Wilkens, Jerry Sloan, Pat Riley, Popovich, George Karl, Phil Jackson, Larry Brown and Adelman. Do you ever think about how hard it must be to get to that point? Stotts: I mean, it's remarkable. 'Nellie' and George and Lenny and Rick and Jerry — all those guys I have such respect for. I'm a guy who appreciates NBA history from a coach and player standpoint. I really am in awe when players and coaches accomplish great things. Tribune: What are the most important ingredients in making a successful NBA head coach? Stotts: Having good players. Every successful coach would give credit to those players. Also, being able to adapt to different situations. Being true to your personality. One of the things I'm impressed with is when coaches can go to multiple franchises and reinvent their style. Look at the way Pat Riley's teams played in L.A., and then the way they played in New York and Miami. Mike D'Antoni coached one style of play (in previous stops), and now has a different style in Houston. Don Nelson was an innovative coach. He was a defensive coach in Milwaukee and then re-invented his game from an offensive standpoint (at Golden State and Dallas). Successful coaches also have great relationships with their best players. In Utah, it was Sloan with (John) Stockton and (Karl) Malone. Riley had Magic (Johnson) and Patrick (Ewing) and Alonzo (Mourning). Phil Jackson was with Michael (Jordan), Kobe (Bryant) and Shaquille (O'Neal). The relationship you have with your best players creates a solid foundation. Tribune: You've been called a players' coach. Do you agree? Stotts: I'm not sure. I am who I am. I try to be respectful. I try to be honest. I don't play games. I do give players freedom on offense, but ... to me, if you're a good person, you're a players' coach. Tribune: What has it been like coaching in Portland in comparison with your other NBA gigs? Stotts: The talent. I've had more of it (in Portland). LaMarcus (Aldridge) and Damian (Lillard) have been All-Stars and All-Pros. I've had good pieces to work with. I didn't have All-Stars in Milwaukee or Atlanta. What's unique is the (difference between) the team we had the first three years and the second three years in Portland. Tribune: You seem like you're a Portland kind of guy. Stotts: I like the size of Portland. I'm not a major-market kind of guy. I like the market size here. I like the people. I like the uniqueness of Portland. I like the Northwest. So I do have an affinity for the city and the region. Tribune: At what point in your life did you begin to think about a career in coaching? Stotts: When I was in Great Falls, Montana, playing for George in the early '80s. I'd played two seasons with him there. He wanted me to come back for a third year. I said, 'Yeah, I'll come back if I can be a player/assistant (coach).' I didn't become a coach until seven years later, but that's when I first gave serious consideration to being a coach. Tribune: You coached for many years under Karl and also four years with Rick Carlisle in Dallas. Besides them, are there other people who have been a major influence in your coaching career? Stotts: Those two are the primary ones, but my dad (Frank Stotts) was a high school basketball coach. That's where my love for the game came from. (His father's career) had a profound impact on me. Also, the people I played for — my college coach (Dave Bliss), my high school coach (George Fielding) — I had such respect for them. But it all started with my dad. Tribune: This is your 26th year as a coach in the NBA, including 15 as an assistant for Seattle, Milwaukee, Atlanta and Golden State. How much has coaching changed since you first sat on an NBA bench in 1992? Stotts: Players are very professional these days. They go about their business. They take a lot of pride in what they do. They take care of their bodies. Not that it wasn't like that when I started, but because of the training facilities, everybody has the opportunity to maximize their potential. There's so much more money in it for players now. Stylewise, the game has opened up. It's gone in a cycle. The pace had ground down in the '90s, and now it's picked back up and become more of an offensive game. In the '90s, it was much more of a grind-it-out game. Tribune: How about the proliferation of analytics? Stotts: There is more information out there now, for sure. The 3-point shot is the biggest analytic that has changed the game. I don't know how much the other analytics have changed it. The ability to get player combinations — information on how certain groups or players play together — that helps. But some of the analytics is overkill. You've always had a box score. You could basically figure out a rebounding or assists percentage. The stats haven't changed. How they manipulate the stats has changed. Tribune: You've been Western Conference Coach of the Month five times — once a season since the 2013-14 campaign. How much does that mean to you? Stotts: I'm proud of that as well. We've had some good runs. In this league, you have to weather the storm when you have a bad one, and to have a good year, you need to put together a run along the way. We've been fortunate enough to have a month every year the last five years where we had a really good record. Tribune: In what ways are you a better head coach now than you were when you first became one in 2002? Stotts: When I got the head jobs in Atlanta and Milwaukee, the only coach I had to refer to was George. I spent so much time with George, that was my foundation. During my time with Rick, I saw a different way, gained a different perspective, and it did me a lot of good. They're very different in their coaching styles. That allowed me to come to Portland and be more comfortable with what I want to do. As you get older, you do get a little bit more comfortable in your point of view and how you see the game. I was very fortunate to get a third chance (after being fired by the Bucks and Hawks). I wanted to make the most of it. I know I feel more of a mentorship with my coaches now. I give them a lot of responsibility during practice. I want them to think like a head coach, and hopefully they can go on to become head coaches. I'm probably more comfortable with what I want to do. There are times when I question this or that or debate things with myself, but I'm more comfortable with how I view what I want to get done. Tribune: What does it take to win a championship in this era? Stotts: Sixteen wins. It's a grind. I've been fortunate enough to be in the finals twice, once each in Seattle (losing to Chicago in 1996) and Dallas (beating Miami in 2011). It's four rounds — two months — of playing very good basketball. Tribune: What is the most rewarding thing about your job? Stotts: The most rewarding thing for high school and college coaches is to see young men grow within that time. You don't get the opportunity to do that very much in the NBA, but I do think it's rewarding when you have players go on and be successful, players like 'Dame' and CJ (McCollum). I look at the second-round picks or young players who didn't get much of an opportunity to play early for us — guys like CJ, Will Barton, Pat Connaughton, Allen Crabbe. It's great to see those guys grow as players, whether their opportunity is here or somewhere else. You feel a part of it. The rewards of winning are harder to view. The games come and go, and you don't have a chance to sit back and enjoy them. The big moments are rewarding. When Damian hit that shot to beat Houston (in the 2014 playoffs), that's a great moment. When you have a great road win like last year in Oklahoma City when 'Dame' was out — when you have those, they're rewarding. Tribune: You're the fifth-oldest head coach in the league (behind Houston's D'Antoni, San Antonio's Popovich, New Orleans' Alvin Gentry and Detroit's Dwane Casey). How much longer would you like to do this? Stotts: You never think you're as old as you are, especially the older you get, but it's reality. I'm going to coach as long as it's enjoyable, as long as somebody wants me to coach a team. A lot of the time, that decision is made by them. Being around a team is good for your health. You ask anybody after the fact, that's what they enjoyed the most — the locker room, the buses, the meetings. They enjoyed the time they spent with the coaches and players.